Boka Haram: How to Help! WWII Vet Honored, 70 Years Late!!! 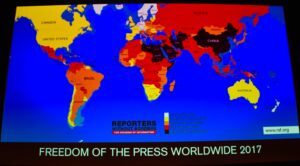 As information warfare becomes a hotter topic, journalists have become bigger targets for repression and even assassination, a troubling trend that is spreading across the globe, reports veteran war correspondent Don North. Amid a surge in violence against journalists, two Paris-based press-freedom organizations have launched a project aimed at securing information collected by endangered journalists and continuing their work if they are imprisoned or killed. 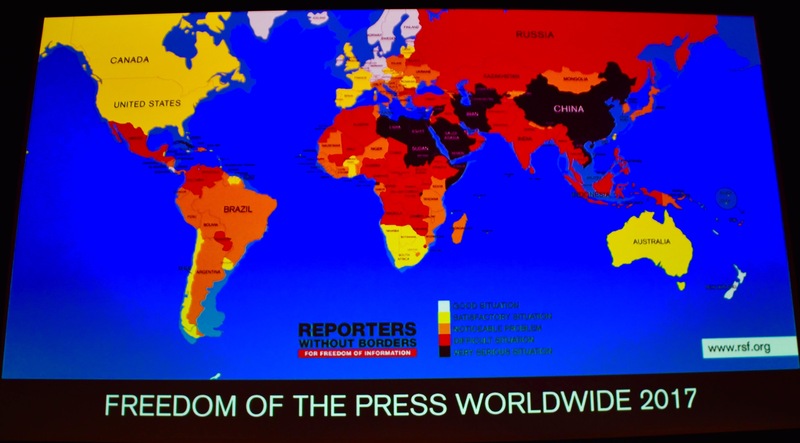 A map produced by Reporters Without Borders, charting by color the greatest danger zones for press freedoms. The Forbidden Stories project is the brainchild of Reporters Without Borders (RSF) and Freedom Voices Network as a counter-strike against repressive regimes and other powerful forces that engage in intimidation of independent journalists. The project is a response to a global surge in violence against journalists, with 42 reporters killed this year and another 183 journalists in prison. 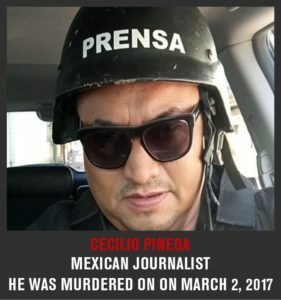 More than 800 journalists have been killed in connection with their work in the past ten years. “This project will send a very clear message to oppressive governments that if they touch a journalist anywhere in the world, many others will be ready to support and follow up their story,” said Can Dundar, a Turkish journalist supporting Forbidden Stories. Under the project, journalists who feel threatened will be able to use encrypted communications to protect sensitive information and put their ongoing investigations in a safe place. Their stories will be secured and not published without their agreement. However, if something happens to them, Forbidden Stories will be in a position to finish their investigative stories in accordance with the journalists’ instructions and to disseminate the information widely thanks to a network of media committed to defend the freedom to inform. In other words, the Forbidden Stories project seeks to ensure that reporters’ work will survive even if they do not. Simultaneous to the launch of Forbidden Stories last week was the release of the “2017 Global Impunity Index” by the Committee to Protect Journalists, calculating the unsolved murders of journalists over the past decade. This year, new murders occurred in half the 12 countries on the index. Somalia leads the index list, which also includes Iraq, Syria, the Philippines, South Sudan, Mexico, Pakistan, Brazil, Russia, Bangladesh, Nigeria and India. 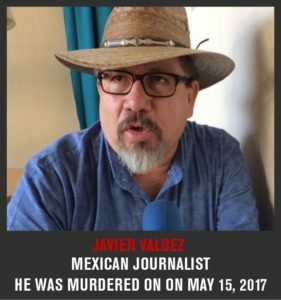 In the Americas, Mexico has become an exceptionally dangerous place for journalists, with 11 murdered in 2017. Forbidden Stories has taken a particular interest in the work of three Mexican journalists — Cecillio Pineda, Miroslava Breach, and Javier Valdez — who were killed while doing investigative reporting on drug cartels. Investigations of drug cartels often cross paths with powerful politicians. For instance, Cecillio Pineda was murdered on March 2 after drawing attention to a friendship between the head of a criminal gang and a local legislator. 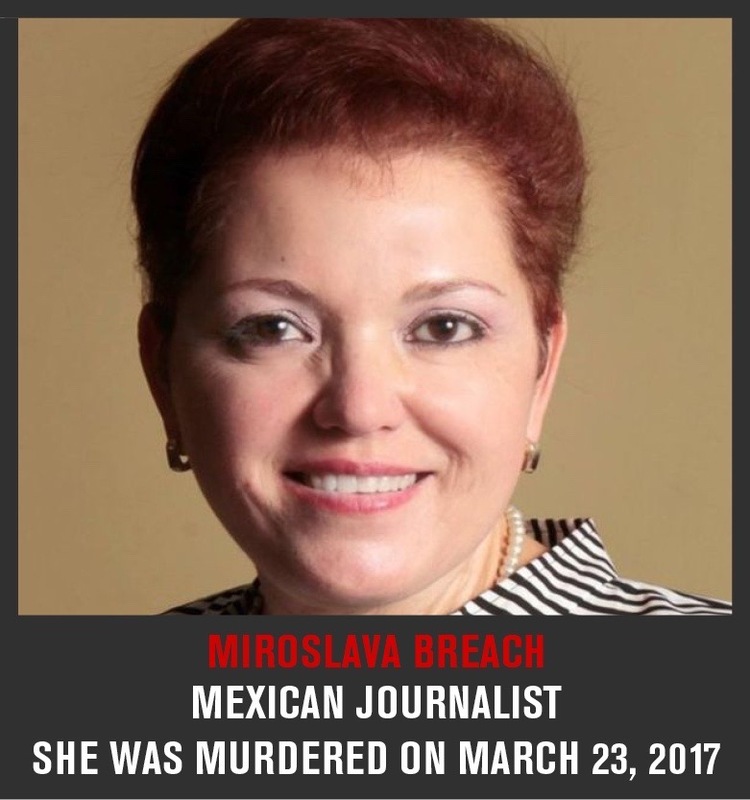 Miroslava Breach was murdered on March 23 after publishing the names of municipal election candidates who were secretly backed by drug traffickers. Her newspaper also was closed down. Javier Valdez died on May 15, a few weeks after he interviewed Damaso Lopez, one of the contenders to replace Joaquin “El Chapo” Guzman as head of the Sinaloa cartel, one of the world’s most powerful drug operations. Guzman’s arrest touched off a bloody internal war and Valdez apparently became a target because of the Lopez interview. But the life-threatening predicament for journalists is global. The most recent killing of a prominent journalist who was investigating corruption was that of Daphne Caruana Galizia on the island of Malta. Galizia had ceaselessly reported massive government corruption in this favored tax haven. The Times of Malta reported she had alerted the police two weeks earlier that she was receiving threats. Less than 30 minutes after filing that statement, the car she was driving was blown to pieces. For journalists around the world this danger appears to be the new normal. They are rounded up en masse and imprisoned in Turkey. In India, journalists were slapped with defamation suits when they reported on suspicious actions of the powerful. Others have been beaten by mobs or murdered. In the Philippines, listed as the fourth most dangerous country for journalists, President Rodrigo Duterte alarmed the media community by publicly expressing his view that, for some journalists, killings were justified. Justice has come to a complete standstill for the 32 journalists slaughtered in the 2009 Maguindanao massacre. Not one of the more than 80 accused has been fully tried in the seven years since the massacre. 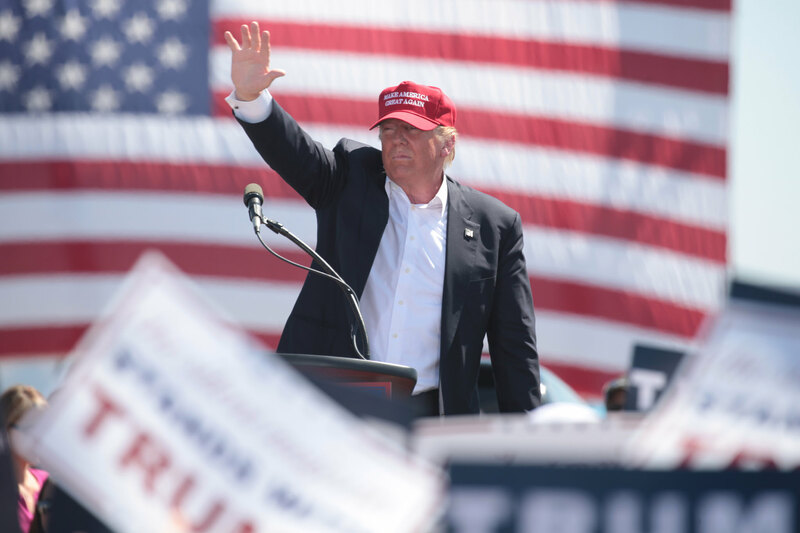 Historically, the U.S. government has been viewed as a staunch advocate for press freedom, but that has changed amid the toxic environment that exists between Trump and many mainstream journalists, some of whom have been open in their contempt for him. Trump, in turn, has made clear his hostility toward the mainstream news media, frequently making journalists the target of his stump speeches while some of his supporters chanted a term used by Nazis “Lugenpresse” (translation: lying press). The day after his Inauguration in a speech at CIA headquarters, Trump said, “I have a running war with the media. They are among the most dishonest human beings on earth, right?” Trump’s message resonates with autocrats around the world and can widely be viewed as encouragement for more assaults on journalists. That is not to say that journalism is perfect – it surely isn’t – or that journalists can’t be annoying on occasion, but the profession and its practitioners play a crucial role in exposing wrongdoing and holding powerful people accountable. The Forbidden Stories project is a step in defense of that principle. This article was originally published in Consortium News. Vlad Putin on CANADIANS TO TRUMP ‘NICELY’: WE’LL NOT BE PUSHED AROUND!! !